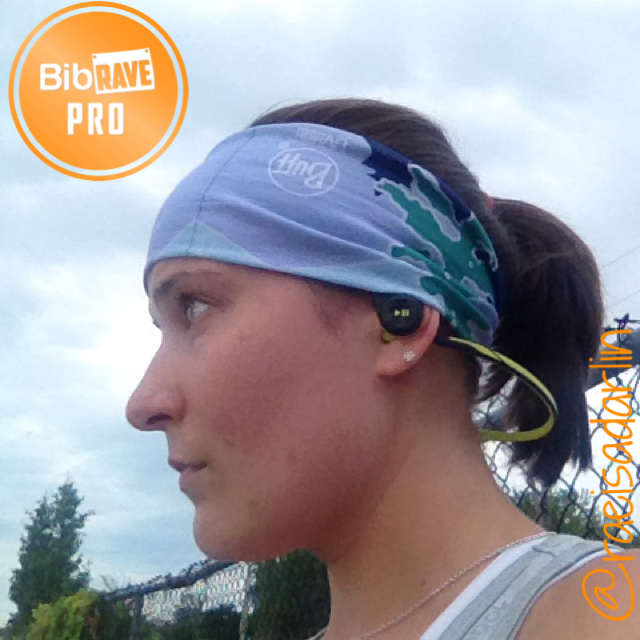 Disclaimer: I received Plantronics BackBeat FIT wireless headphones to review as part of being a BibRave Pro. Learn more about becoming a BibRave Pro (ambassador), and check out BibRave.com to review find and write race reviews! Over the last several months, I’ve moved away from running with music. It’s a safety thing for me–I’m usually running outside, and running solo, so I feel like I need to be able to hear cars, loose dogs, and other potential threats. As such, my need for headphones during the summer is pretty much nil. However, during the winter, I DO NOT RUN OUTSIDE. Pretty much ever. Unless I’m racing, which is also rare. In the frozen New England winters, I take it to the treadmill, and when I’m on the treadmill, I NEED music. But we all know that running with cords dangling is unpleasant at best, potentially dangerous at worst. I can’t tell you how many times I’ve accidentally caught my headphone wire while treadmill running, sending my phone/iPod flying and nearly tripping and falling. I’ve been casually perusing the market for wireless headphones for a while now, but I wasn’t ready to take the plunge. Thankfully, the BibRave Pro program offered me an opportunity to test the Plantronics BackBeat FIT wireless headphones recently. I was aaaallll over that. I immediately liked the design–over the ears to help them stay put. Two excellent color choices. And lots of built in safety features that have runners and other athletes in mind. Surprisingly, I had no trouble connecting the headphones to my iPhone. The instructions were clear, and I was able to listen to music right away. At first, I had trouble with the volume controls–they weren’t super intuitive, and I ended up blasting myself at full volume more than once on the first run, but after that, I did fine. These headphones were incredibly comfortable; in fact much more comfortable than I’d dared to hope for. The ear piece sat securely in my ear without moving or slipping, and the ear hooks kept them in place. They didn’t make my ears hurt like many earbud style headphones I’ve tried, which is a huge bonus. My only complaint from this initial run was that my ponytail bouncing against the part of the headset that wraps around behind my head was REALLY annoying–I could hear each thump through the headphones, as well as feel it pushing against my ears. I mitigated this issue on later runs by either securing my ponytail under a headband, or securing the headset under a headband. My second run in the headphones was the very next day, and I was already much more comfortable with the volume controls. My phone connected to the headset right away, and I was able to set out on my morning run with little to no extra effort. I really liked that when powering the headphones on or off, you actual get an audible confirmation from the headset in your ear, so you don’t have to guess. It also lets you know how you’re doing on battery power, which is incredibly helpful. On Sunday, I was able to test out the “liquid repellant” properties. I decided to go for a run without checking the weather, and emerged from my apartment to find that a light rain was falling. I pressed on, figuring I might as well just get it done, and ran though some showers with no problems at all. With about 1 mile to go, the skies opened up and it started POURING. Not wanting to tempt fate, I whipped the headphones off and stuck them in my shirt for the remainder of the run. Even though they got fairly wet, they are still in perfect working order, so I can vouch for the fact that they are quite water resistant. The headphones also come with a neoprene armband that is reversible–when turned inside out, it becomes a handy, compact storage case for the headphones and the included charging cable. As an armband, it’s fairly good. Not the most comfortable, but not what I’d consider uncomfortable. It’s a good size (although I do have a fairly small phone, the iPhone 4s), and the little slip pocket in the back is perfect for my apartment or car key. I’m certain I could also fit a packet or two of Gu in there if I needed to. I have slight concerns that repeated turning could cause the seams to bust, but so far, they seem to be holding up well. The only function of these headphones that I haven’t had a chance to try yet is accepting phone calls. I’ve only had them for a week, and intended to have Ben call me while I was out for a run, but never got around to it. I’m sure that as I continue to use them, I’ll be able to use the call function, and I’ll give an update on that when I can. I think I’ve found my perfect running mate in these headphones. The sound quality is great, and the volume range is pretty impressive. I keep it turned down fairly low when I’m running outside for safety reasons, but judging by how well I blasted myself when adjusting to the volume controls, I’m confident that I’ll be able to get enough volume out of them to drown out gym chatter when I have to take my runs to the treadmill this winter. The easy pairing with my phone is great for me because I’m not super tech-savvy, and they are incredibly comfortable. At $129.99, they’re certainly not inexpensive, but I’ve always been of the opinion that you get what you pay for. You might be able to find some cheaper Bluetooth headphones, but I doubt they’d work as well as the Plantronics BackBeat FIT. Also, Plantronics will be sponsoring our Twitter #Bibchat tomorrow (Tuesday) night at 9 pm EST. They’ll be giving away THREE pairs of BackBeat FIT headphones–Don’t miss it! Have you ever tried wireless headphones? Which ones do you use? I really like these, though do find that they aren’t quite loud enough when I’m running outside in loud conditions. See, I’d rather hear the traffic than not, so it works well for me. I’m paranoid! I have tried wireless headphones! They hurt my ears – I think they were too big. You could also take them in the shower which felt oh so wrong!! Yours look great! They’re really, really nice. I’m super lucky to have gotten a pair. I’ll have to check these out when my current pair of headphones kicks it. Great review! Thanks! I try to be pretty thorough. And I really do like these. I have been hesitant to try wireless headphones because I am always concerned that they will zap my battery because of the bluetooth and the length of the run. But these sound great, and sure, they aren’t cheap, but cheap just means that you would have to buy more of them, so what is the point? Great review! My fellow BRP Angie mentioned that she puts her phone in Airplane mode for longer runs, and that really helps with battery life. I’m usually not out for more than an hour or so, so zapping my phone battery isn’t a huge concern for me. Though I don’t run with music, these look pretty cool! I usually don’t either, but these are changing my mind! I hadn’t heard of them either, but Runner’s World featured them recently as one of the top 10 best headphones for running! I’ve been intrigued by bluetooth headphones for a while, but haven’t wanted to bite the bullet in regards to the price tag. This just makes me want them more! Christmas isn’t that far off, is it? Haha. Oh, and a question, I often run with only one earbud in when I’m outside, for safety, but I think this would be awkward with most bluetooth headphones I’ve seen, what do you think? It would probably be difficult to do it with most headsets, as they’re designed to wrap around your head–it would end up flopping all over. These are designed specifically to let ambient noise in, and when I kept the volume turned down, I could still hear cars and other stuff around me. Is the cord loose or shaped round like that? I would like wireless headphones but I only run with one earbud in, so I need to be able to tuck one under my shirt strap. Those look pretty awesome though! They’re sort of floppy–you can bend them any which way, which is great! Yeah, they certainly aren’t cheap, but so, so great!